The FHA Bad Credit Loan myth is a common one, but the truth of the matter is that FHA loan rules, as printed in HUD 4155.1, do list minimum credit scores. "How low can a credit score be and still qualify for an FHA home loan? Mine is in the mid-500 range. If FHA home loans are for low income people with bad credit why should the score matter at all?" The "FHA Bad Credit Loan" myth is a common one, but the truth of the matter is that FHA loan rules, as printed in HUD 4155.1, do list minimum credit scores. A borrower's credit score is one of the most important parts of the FHA loan application data, and it's good to be aware of what the minimum requirements are from the FHA's point of view. 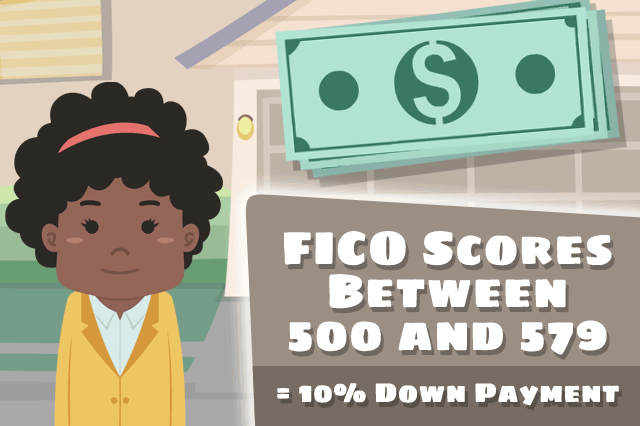 A borrower with FICO scores at or higher than 580 would be eligible, in the eyes of the FHA, for maximum financing. Those with scores between 500 and 579 are eligible for a maximum FHA financing amount of 90% of the loan-to-value ratio, which means the borrower would be required by the FHA to make a 10% down payment. Those with scores below 500 are not eligible for FHA loans. Participating FHA lenders can and do have more strict FICO score rules than what you see mentioned above. Bottom line--loan applicants who do not meet the minimums listed above can't be approved for an FHA home loan or can't be approved for maximum financing depending on the circumstances as detailed above. In many cases you may find lenders with credit score requirements between 620 and 640. Borrowers with credit on the margins of what's acceptable to a lender may be required to make a bigger down payment or have other compensating factors that work in the borrower's favor. Another misconception about the FHA loan program is that it is only meant to be used by first-time homebuyers, or that it is only for borrowers who have low incomes. But in reality there are no minimum OR maximum income limits established for FHA loans. You can't earn too much with the FHA loan program--there's no maximum income requirement, and anyone who credit-qualifies is eligible to apply. Your debt to income ratio, your history of repaying your financial obligations, and your FICO scores are among the main criteria used to approve or deny your home loan application.